Big 5 is played with 5 decks. A player is entitled for late surrender if the dealer is showing any card other than an Ace. Splitting is allowed for two cards of an equal value (e.g., a Jack and Queen hand) or of an equal denomination (e.g., two Tens). After splitting, a player must place the same bet on a new hand. A player can double down on any hand, except for a blackjack hand. The dealer follows the “hit-on-soft-17” rule without peeking at a hole card if a face-up card is 10 or Ace. The house edge for Big 5 is 0.47%. 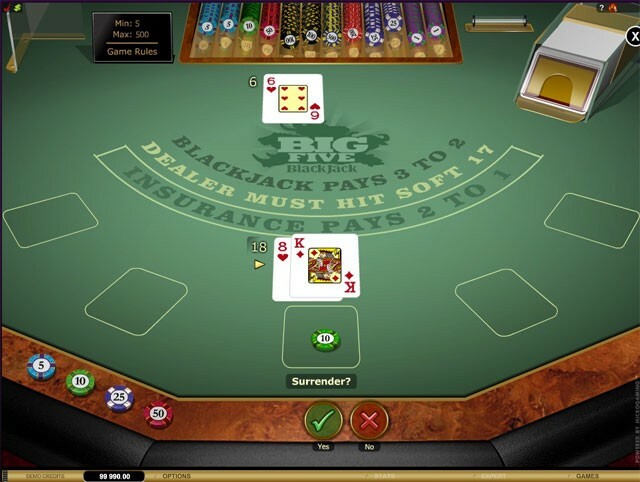 This blackjack game is offered by Microgaming.